prints, but maybe you didn’t know the copier upstairs is the only place you can print with color? the print menu, the Multifunction printers (MFP) (aka the big copiers downstairs and upstairs)will staple things for you right in the machine. Easypeasy. 2. There are records, and a record player. other local thrift store and you saw a killer vinyl for just a couple bucks. You have a phonograph at home, but home is oh so far away. Problem solved! 3. During finals week, there is free coffee. That’s right. Your heard me. Free coffee. ‘Nuff said. collection of rare books, some even dating back to 1700. Let’s say you’re working on a project and trying to come up with a unique angle to impress your prof. You can find sources from the 1800’s and see what the theologians of that time thought and compare it to what you’re learning in your classes today. The possibilities are endless. These sources must stay in the library, but you can come during office hours (84:30) and get special permission from a full time librarian to use a certain book. You can find titles by searching on the website just like any other book. 5. There are study rooms. If you have a group project, or maybe need to find an even quieter place than the library, these rooms are spacious and allow you to spread your homework out in a private space. 6. Free books and book sale. prices. And there is usually a cart of free books hanging around the front doors of the library for anybody to take advantage of. professor will put the required textbooks/books on reserve at the library. So instead of spending all those extra bucks, check with the front desk! You can check out reserve books at the front desk and have them for 2 hours. You can simply read, or scan what you need at a copier, send it to yourself, and be ready to go. The library also has a collection of movies behind the front desk, and it is a decent selection. Check it out! The library has amazing collection of eBooks, as well as DATABASES. These resources are an incredible asset to writing any paper ever. There is an extensive list that allows you to choose a database that specifically fits the subject of your paper, and then you can do a detailed search. The best part is that these resources are accessible from anywhere. So check them out. Footnote: Ask your librarians anything. If you have any questions, we love to help if we can, and find out if we don’t know. We also like it when people acknowledge our existence and talk to us,even if it’s a smile. So embrace your library. Learn the ways of the books. events, competitions with lucrative rewards… Do it. Before we dive into the essence of this article, take a moment to describe what you think the function of the Masland Library is. You will probably recall the heavy coursework of this past semester’s homework that you diligently completed in the library and decide that the Masland Library is a place for students to read books, research, and write papers. While this is the primary function of the library, I want to propose the library can be thought of as something else: a resource for social entertainment. Mind you, the Masland Library is not where the social entertainment should take place, but we do have a number DVD’s, CD’s, and books ideal for your social affairs. Therefore, I have compiled a list of some of the Masland Library’s finest materials so that you may realize the full potential of this library as a resource for social entertainment. This blog will focus on movies and will be followed by two more blogs on music and books for social entertainment. Few people realize that behind the front desk at the Masland Library are many movies that people watch for recreational purposes. Besides documentaries, educational films, and operas there are 150 recreational films. Below I have highlighted some of the library’s best films according to genre. Check one out the next time you visit the library! These operas are only 5 of about 100 operas the Masland Library has on DVD. You might have to be a true musical geek to check them out. If not, watch one anyway and consider yourself cultured. Do not underestimate the entertainment of a musical put into film. It may not have the same feel as a live performance, but remember the cast had unlimited tries to perfect each scene. Westerns might not be everyone’s thing, but try widening your horizons with these two films. The books are called “classics” for a reason. These are sure to be worth the time to watch with your friends. Follow up by discussing how the film answers the enduring questions. For all Disney fans, be sure to enjoy yourselves with these two Disney favorites. Feel free to sing along. If you have not watched Star Wars by now, the time has come. The original trilogy made significant advances in the use of special effects and drastically shaped our culture. Any of these four sci-fi movies are a good choice for your movie night. Experience some of the world’s 19thand 20th century wars through these popular historical war films. I daresay Schindler’s List will draw a tear or two. All of these films are also drama pieces but they are based on real people from the real world. Learn to see life through someone else’s eyes. Yes, the library does indeed have all three The Lord of the Rings movies. These movies are so fantastic I decided to separate them from the others in this list. We can only hope the library will add the new The Hobbit movies to the collection. Let’s be honest, sometimes the weekends seem a bit dead around here with many people heading home to be with family. It’s fun to go out with friends and try to do eventful things on the weekends, but typically that requires money, which many of us don’t have much of. Therefore, a great thing to fall back on is just hanging out with some friends and watching a movie. Finding someone who has Netflix or a good selection of movies in their room can be difficult at times, but did you know that the library has movies? You can ask to look at them behind the front desk, or better yet, you can actually look up the whole list online! You can find this list by typing in “feature films” in the search bar at library.cairn.edu. The list under featured films is most, but not all, of our movies; to find the complete list you can also go to library.cairn.edu/search/e and type in “PN 1997.2 or PN 1997.3”. You can browse through them, see what looks interesting, and the best part is that you don’t have to worry about driving anywhere. Although we may not have the widest selection to choose from there are several good movies. 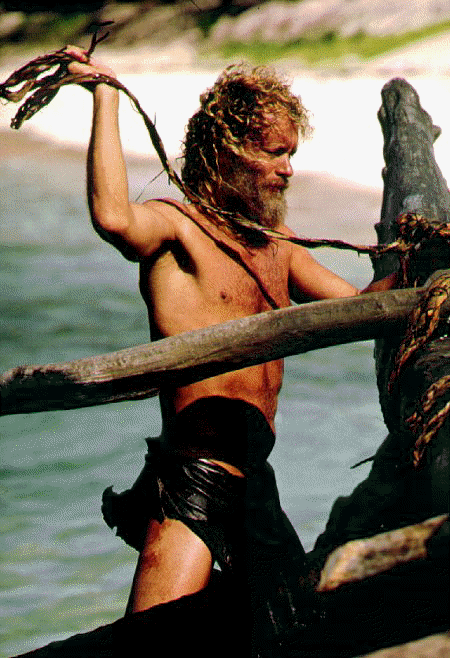 Cast Away, Enchanted, Star Wars Episodes 4-6, and Stranger Than Fiction are just a few of the movies that we have to offer. 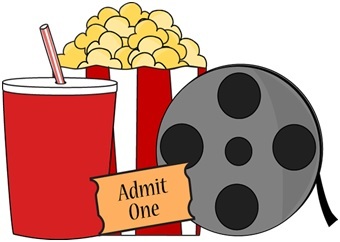 Just remember, if you were hoping to watch a movie on Friday or Saturday night try and plan ahead a little because we close at 7pm on Friday and 6pm on Saturday. Have a great weekend! Where can you find the Library book drop? Student workers Allison Beyer, Zak Fixler, and Hannah Blackmer will help us find the way. For those of you stuck on campus over the weekends and looking for something to do, you might consider going to the library to check out a movie. It’s free, on campus, and you might be surprised by the selection. We have a wide variety of movies varying from documentaries to musicals, from westerns to sci-fi /fantasy, and many more! There is no need to be bored on campus, the Masland Library can provide for your entertainment as well as for your studying needs. Just this past weekend, I had checked out the movie Stranger than Fiction, which is one that I had never had the opportunity of viewing before, and I really enjoyed it. The story follows Harold Crick, an IRS agent, who suddenly begins to hear his life being narrated by an unknown female voice. Unfortunately she is predicting his death. 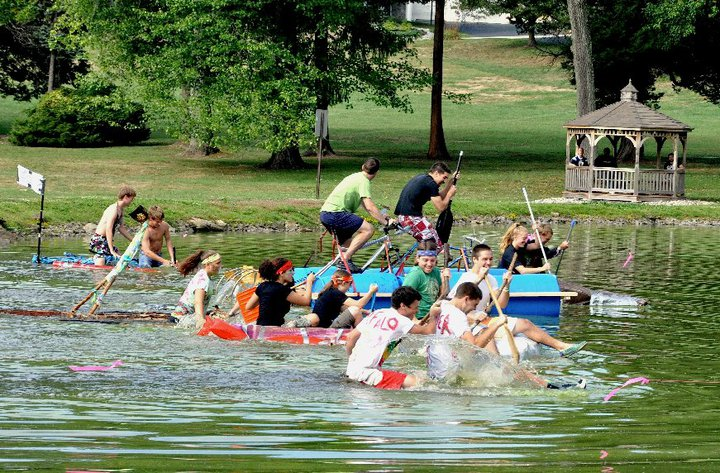 Today, Wednesday 29, Philadelphia Biblical University held its annual boat raise. After creating their own devices for crossing the water – as I can I hardly deem them boats – a few brave individuals ventured across the pond. Unfortunately, a number of the boats failed to perform adequately enough to support their crew across the water. Thus, they subsequently sunk bellow the murky (to say the least) water. If, as I, you were reminded of the scene in the film Cast Away in which Tom Hanks’ character flees from his island prison on his self-constructed raft, and wish to watch this awesome film, it is available at the front desk of the PBU library along with many other classic titles. Although the boat race was very funny, the individuals manning the sunken vessels could have easily prevented the occurrence if they would have simply spent some time investigating the physical properties of flotation on the databases available through the library. Listed on the PBU database web-page are numerous databases that relate not only to science but a multitude of other topics including everything from food to politics. For example, Victor L. Streeter, an engineering professor at the University of Michigan, wrote an article that explains how buoyancy works on the Access Science database from McGraw-Hill. If, however, you are looking for a more in-depth study of buoyancy to drastically increase the success of your own personal homemade boat, the Article First database offers large number of articles that pertain to the different highly complex aspects of buoyancy. Next time you are attempting to design a homemade boat, or even writing a research paper for a class, check out the databases available on the PBU Masland Library website.